At IBC 2018, MultiDyne will give a European debut to the SilverBack V, the latest in its popular SilverBack series of camera-mounted fiber transport solutions. The industry’s first 12G- and 4K-capable camera-back system to incorporate an IP output, the SilverBack V enables the convergence of fiber and IP-based production workflows while building on the renowned flexibility and robustness of the SilverBack family. MultiDyne will demonstrate the SilverBack V at IBC2018 from September 14-18 at Stand 11.D40 at the RAI Convention and Exhibition Centre in Amsterdam. MultiDyne’s SilverBack camera-back transceivers are well-known for enhancing connection flexibility and providing high-bandwidth performance needed by Ultra HD formats. SilverBack V adds to this fiber transport foundation by integrating an IP Gateway into the SilverBack V base station, enabling users to deliver content to studios and mobile production vehicles over both SDI and IP network connectivity. In addition to its IP capabilities, SilverBack V also brings new features and benefits to fiber users in markets ranging from electronic newsgathering (ENG) and live sports coverage to motion picture productions and other remote contribution applications. SilverBack V supports both single-link 12G and quad-link 3G SDI connectivity, maximizing 4K Ultra HD signal interface flexibility. The space-efficiency of the dual-camera base station is paralleled by the reduced width of the SilverBack V camera-back unit, which makes it the most compact unit in the SilverBack family to date. The narrower design enables a much lighter camera-back load and eases operator mobility while still ensuring proper overall weight balance between the camera-back, body and lens. 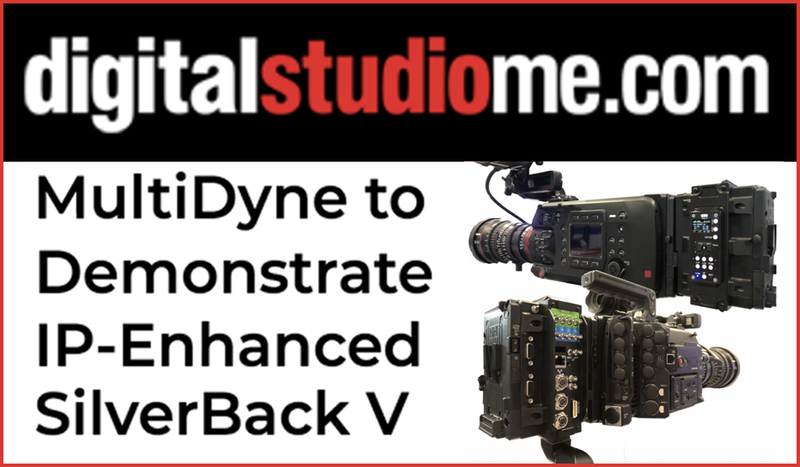 MultiDyne is also working closely with camera vendors including Sony, Panasonic, Canon, JVC and more to develop specific SilverBack V designs tailored to the connection points, color, texture and ergonomics of each camera.